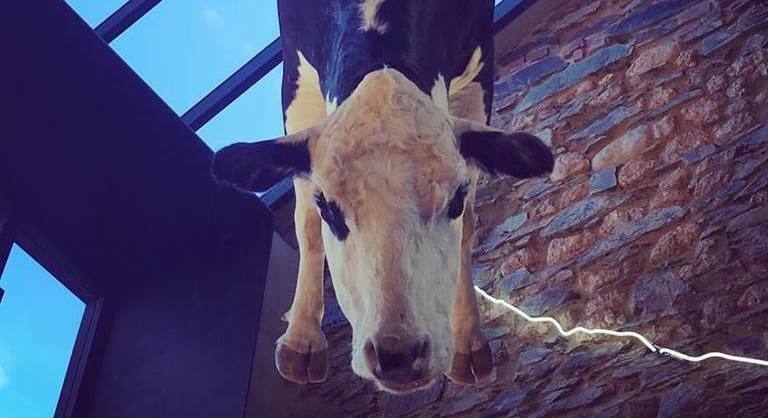 A restaurant in Australia is facing a massive backlash over a dead cow which is hanging from its ceiling. Etica, a pizza restaurant in Adelaide in South Australia, has a stuffed cow hanging from the ceiling by its hind legs. The restaurant owners, Federico and Melissa Pisanelli, have said they want to challenge the perceptions of diners and want to ‘educate consumers on the origins of our food’. The installation has a mission: it aims to draw a connection to the true consequence of consuming dairy. However, it seems people are just a little bit more outraged than they originally planned, after people have made calls for the cow to be taken down. A petition has been signed by almost 5,000 people calling for the cow to be removed from the restaurant. There is a pizza place in Adelaide, South Australia which displays a real dead mother cow’s body hanging over tables by her feet where their customers eat. This is unspeakable, atrocious, and shocking to see. It is a grand display of the cognitive dissonance in our society and creates a space for people to get more comfortable with the dead and torture of other species. This is obscene and we wish for them to take her down ASAP. The restaurant has hit back at the negative backlash and staunchly defends their decision to parade the animal in the dining space. A Facebook status posted by the restaurant has claimed they are trying to promote animal welfare and a conversation about where food is sourced. We do not aim to influence on whether one should consume dairy, but rather, we urge our consumers to understand the origin of their food in order to make a conscious decision on whether to eat it. People weren’t at all convinced with the message the restaurant was trying to convey – one commenter said ‘This is one of the most foul double standards I’ve seen’, another said ‘what rubbish! There are no ethics or morals here!’. Whatever the case, the cow has certainly got people talking about the pizza joint, and not at all in a good way. Might not be the best business idea to keep it up.